Really comfortable, wide footbed but not quite enough for me and doesn't deform as robust. 3 buckles work well but hardship for short journeys. Good calf room with velcro for snug fit. Comfortable to walk in, no squeaks. But big brutes to wear not for dancing! Great service, no messing about, had to send first pair back as too small. Second pair just great. No more to be said . Good quality, comfortable, super fast delivery. A great purchase. Nice looking,light,warm, waterproof and good value for money. Order a size bigger, had to move gear lever up one notch as they are chunky as the toe is big and a thick sole. Should have bought these the first time, I have large wide feet. 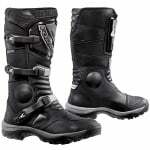 And find it hard to get boots to fit, these are a pleasure to ride and walk in and less than £200 !! Ridden the bike in a storm and only my feet was dry lol. Had a slight problem with the first pair, had to be returned, but Sportsbikeshop sorted it for me. Second pair arrived, I am a size 10 so went for size 45 which fit perfectly. With the clips to adjust can get a thicker pair of socks underneath for the winter. People have mentioned not being able to change gear properly, I have no problem with this, in fact I change gear better in this boot with a more positive feel. Very pleased with them for walking in, just like a walking boot. Would definitely recommend these. 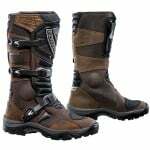 Really comfortable boots, good quality. Only negative is the Forma badge could be more in keeping with the boots but that's me being picky. Extremely comfortable and stylish boots. I take a 45 for my other (TCX and RST) boots, and these Formas are no different. Have kept my feet dry in driving rain, and comfy enough to wear off the bike for extended periods. Can't fault them for less than £200.